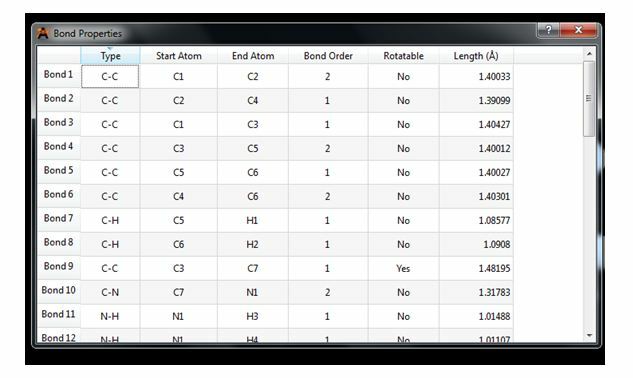 Before starting this experiment's procedure, kindly go through the general procedure described in experiments "To build a molecule using Avogadro software" and "To add Hydrogen to the molecule" for building and adding hydrogen to the molecule to satisfy the atomic valency. In this exercise, one would learn how to minimize the molecule so as find the most stable structure of a molecule. The stable form of the molecule would be the one with the lowest energy conformation. 1. 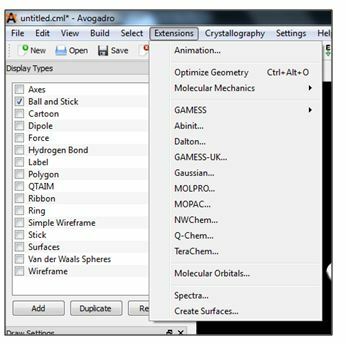 Follow the preliminary steps as indicated above to build a computational model and add hydrogen using Avogadro's software. 2. 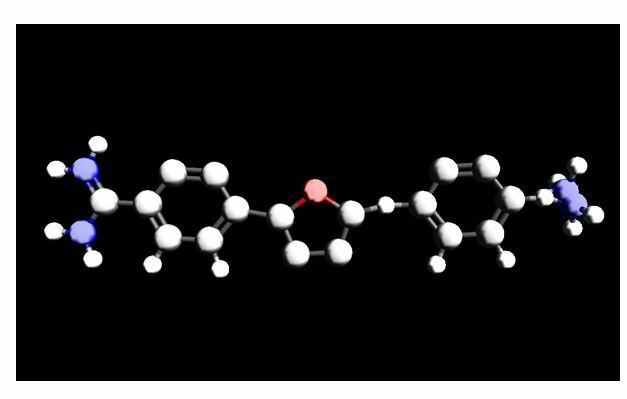 Here as an example we are drawing the structure of DB75 [2,5-bis(4-amidinophenyl)furan], also known as furamidine, is an analog of pentamidine. 3. 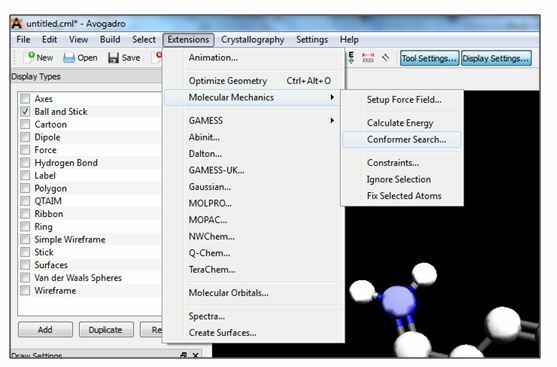 “Optimize Geometry” option which can be located from “Extensions” tab as shown in Figure 2, allows the user to optimize the structure of the molecule to its stable conformation. 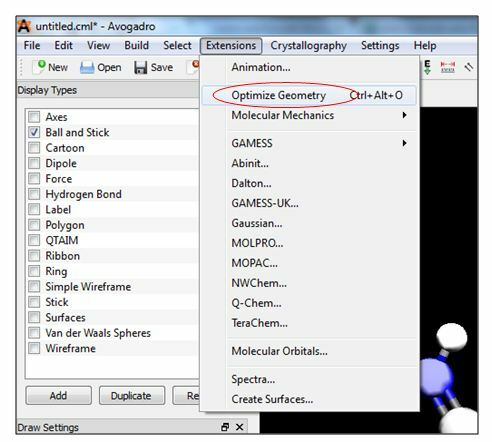 Figure 2: Selecting “Optimize Geometry” from “Extensions” tab. 4. The molecule makes several changes in its atom position through rotation and calculates energy in every position. This process is repeated many times to find the position with lowest energy. 5. 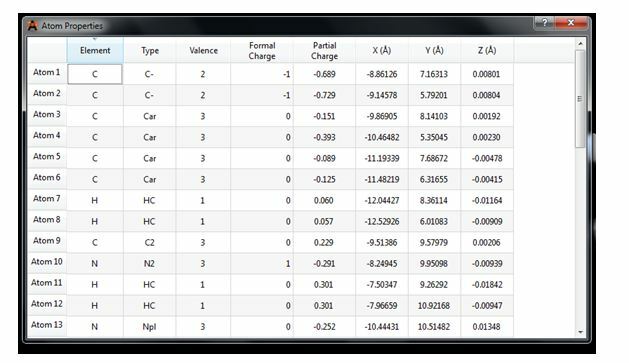 From the “Extensions” tab, user can select “Molecular Mechanics” which allows the user to select other parameters to calculate energy according to their choice as shown in Figure 4. 6. 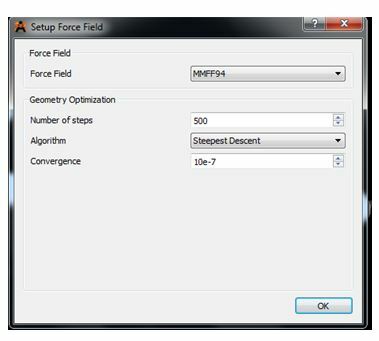 Different options in “Force Field” can be selected by clicking on “Setup Force Field” which displays different types of force fields, algorithms associated with it, number of steps and Convergence as shown in Figure 5, 6 and 7. Figure 7: Different types of “Algorithms”. 7. 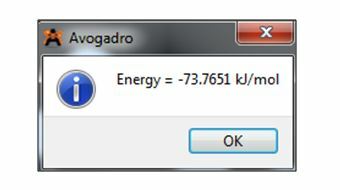 From the “Molecular Mechanics”, user can select “Calculates Energy” option which allows the user to calculate energy of the molecule. 8. 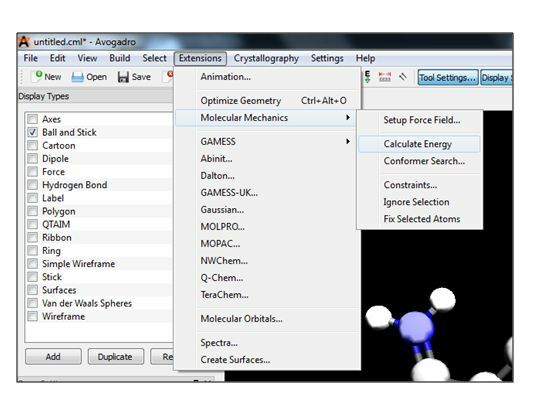 From the “Extensions” tab, user can select other options such as GAMESS, Abinitio, Dalton etc, which allows to perform different quantum chemistry calculations as shown in Figure 9. 9. 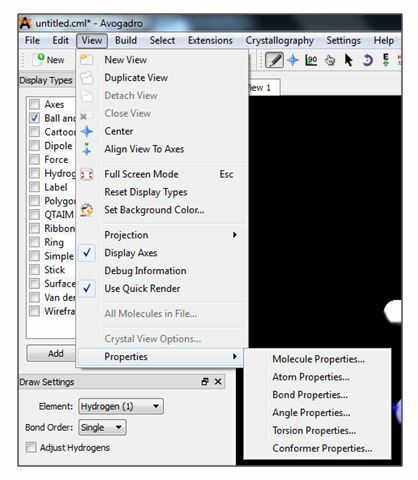 User can view other properties of the builder molecules by clicking on the “View” tab -> “Properties” as shown in Figure 10. 10. 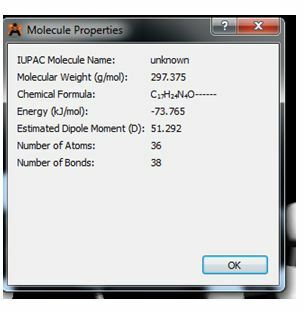 The “Molecular Properties” allows the user to view the IUPAC name, molecular weight, chemical formula, energy, estimated dipole moment, number of atoms and bond as shown in Figure 12. 11. 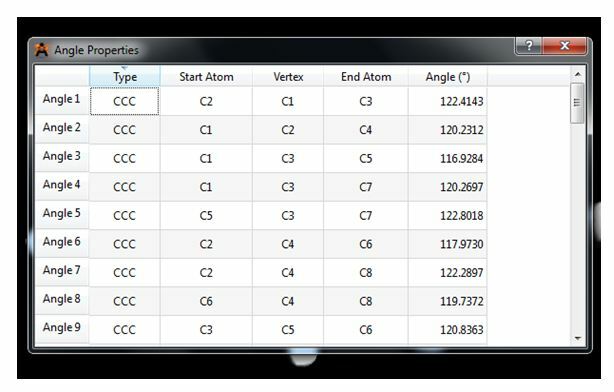 The “Angle Properties” allows the user to find the different angle properties including valency, type, charge, angles etc. of atoms in the molecule as shown in Figure 13. 12. The “Bond Properties” allows the user to find different bond properties with respect to the molecule including its start and end atom, bond order, possibilities of rotatable bond, length in Angstrom as shown in Figure 14. 13. The “Angle Properties” allows the user to find different angle properties including its type, start atom, vertex, End atom, Angles as shown Figure 15. 14. The “Torsion Properties” allows the user to find the torsional properties at different atomic positions as shown Figure 16. 15. 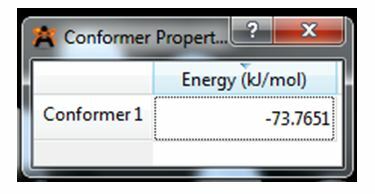 The “Conformer Properties” displays the number of conformers with respect to the molecule with its energy in kj/mol as shown in Figure 17. 16. 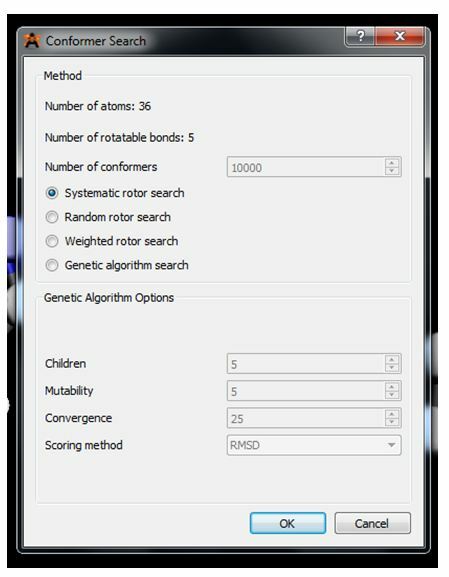 From the “Extensions” tab, click "Molecular Mechanics" from where user can select “Conformer Search” which allows the user to find the number of conformers by different types of rotations with the molecule which is shown in Figure 18. 17. 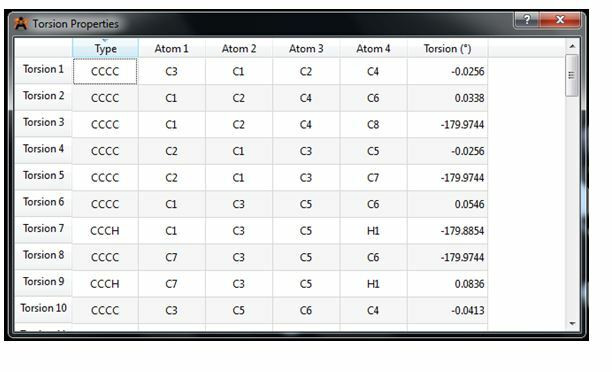 The different options in the conformer search are displayed in Figure 19 which allows the user to give parameters according to their choice.